The top TV Everywhere content type is live sports, with a 37% share, followed by news (32%) and TV shows (28%). Across all online video starts, sports streams were up 640% vs. 2012, whereas all non-sports streams were up 190%. And for sports, smartphones still had slightly greater share than tablets. 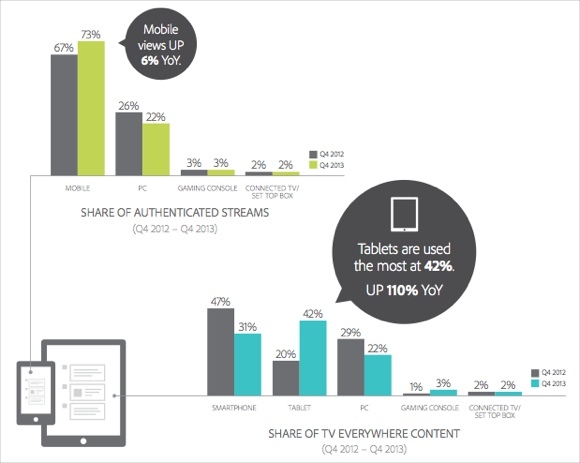 For all TV Everywhere viewing, iOS devices generated 10.1 plays/unique visitor in Q4 '13, down from 14.1 in Q4 '12, with Android basically flat at 8.13 plays/unique visitor and desktop up to approximately 5 plays/unique visitor. As far as how viewers find their way to videos, 58% went directly to the destination site, 20% from search and 16% from affiliates. Facebook was the most popular social referrer with 81% share, followed distantly by Twitter with approximately 12%. For the report, Adobe analyzed 22.5 billion online video starts, including 500 million+ on mobile devices and 574 million+ TV Everywhere streams. The full benchmark report is available here. - A partnership with Microsoft to have its Azure Media Services provide all back-end video processing. - Expansion of "auto-authentication" to subscribers of Cablevision, Comcast, Cox, Midcontinent and Verizon so they don't have to login to view video streams while viewing at home. - Delivery to Comcast X1 set-top boxes - the "Live Extra" app will allow subscribers to replicate the online experience on their TVs. 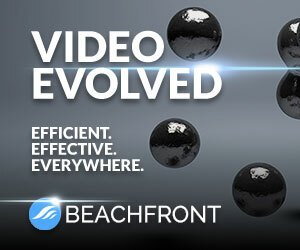 - Dynamic insertion of ads in live video streams across devices. Expanding on dynamic insertion of ads in on-demand streams, Primetime will swap in online video ads in the place of broadcast TV ads for viewers. - A free 30 minute preview window before needing to login with their credentials. A 5 minute per day free viewing period will also be allowed. All in all the upcoming Winter Games are poised to be the most connected, flexible viewing experience yet, illustrating how online and mobile are completely re-inventing sports broadcasting.